The de Young Museum’s compelling retrospective exhibit of the sculpture of Stephen De Staebler opened nine months too late for the artist to see it. De Young’s American Art curator, Timothy Anglin Burgard, worked actively with De Staebler to mount the exhibition, but unfortunately, De Staebler died in May 2011, before the show was completed. 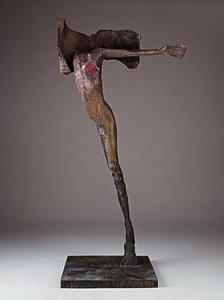 Stephen De Staebler (1933–2011) became a figurative sculpture at a time when such works were déclassé. One of his teachers at the famous Black Mountain College was Robert Motherwell, a leading voice of the Abstract Expressionist Movement, who wanted De Staebler to shift from figurative work to the abstract school. De Staebler decided not to take Motherwell’s advice. Instead, De Staebler benefitted from working with pioneering ceramist Peter Voulkos, who in the late 1950s had founded the ceramics department at the University of California, Berkeley. Voulkos, who was instrumental in turning ceramics into a vital art form, rather than the second-string craft it had been thought to be, introduced De Staebler to clay and kiln techniques. Since his childhood was spent in Missouri’s countryside, De Staebler had a strong tactile and deeply symbolic connection with clay. His long and distinguished career included sculptures of landscapes, masks and humanoid bodies. In the 1970s, De Staebler began twisting clay into pieces of skin, flesh and bone, rubbing powdered oxides on their surfaces and firing them in a kiln. He then joined the pieces together to create large deconstructed human figures. These powerful, thin, vertical, clay columnar pieces are simultaneously modern and ancient, finished and unfinished, hopeful and dispirited. The fractured human sculptures evoke the loneliness and alienation of the post-World War II human condition with raw emotion. De Staebler, a religion major at Princeton, struggled between spirituality and skepticism, which his art illustrates. At the entrance to the exhibit is De Staebler’s “Winged Woman Walking,” a stunning work that has roots in ancient Greek sculpture and yet speaks in a modern voice to the 21st century. The well-curated show consists of 55 pieces in two large well-lighted rooms. One room has a 30-foot ceiling and a large skylight in which De Staebler’s large pieces shine. De Staebler was a leader in the California Clay and Bay Area Figurative Movements and an influential teacher at San Francisco State University and the San Francisco Art Institute. His creations have influenced generations of artists. Their impact continues at this outstanding exhibition and in museums and private collections worldwide. ©Emily S. Mendel 2012 All Rights Reserved.